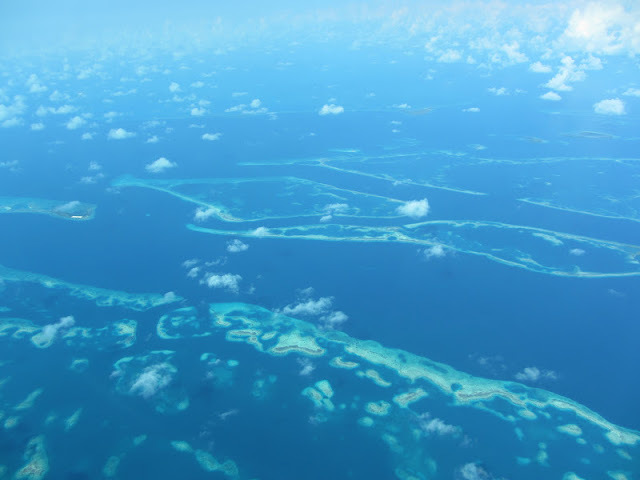 Belize is a very small country with a very small population (about 325,000 people) and relatively few highways. The greatest country width (east to west) is 68 miles. And length only 170 miles! to a Mayan temple surrounded by jungle in about an hour. But that sort of flitting about sure ain’t gonna happen by bus. It’s going to cost quite a bit more to flit…whether going by one of the two air lines in the country or, for those who live the lifestyle of the rich and famous, by helicopter. 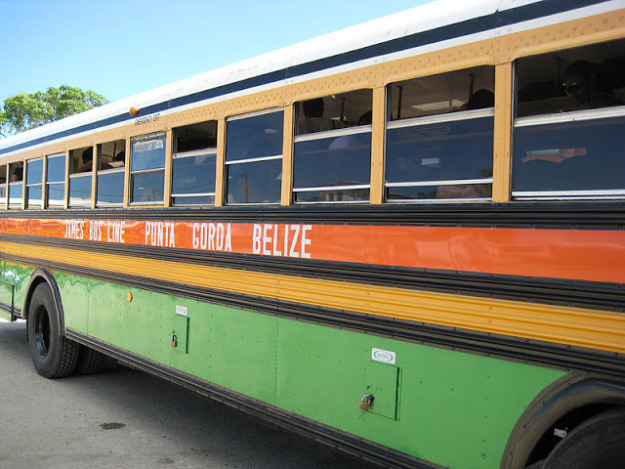 If you don’t have a car on the mainland, bus is the most popular way to get around Belize. It can be slow, but IT IS CHEAP (Belize City to San Ignacio is only $8bzd) and you get to really see the landscape, the people and the local color of Belize. If you live in the country, you always see someone you know. And for all of these reasons, I really like it. 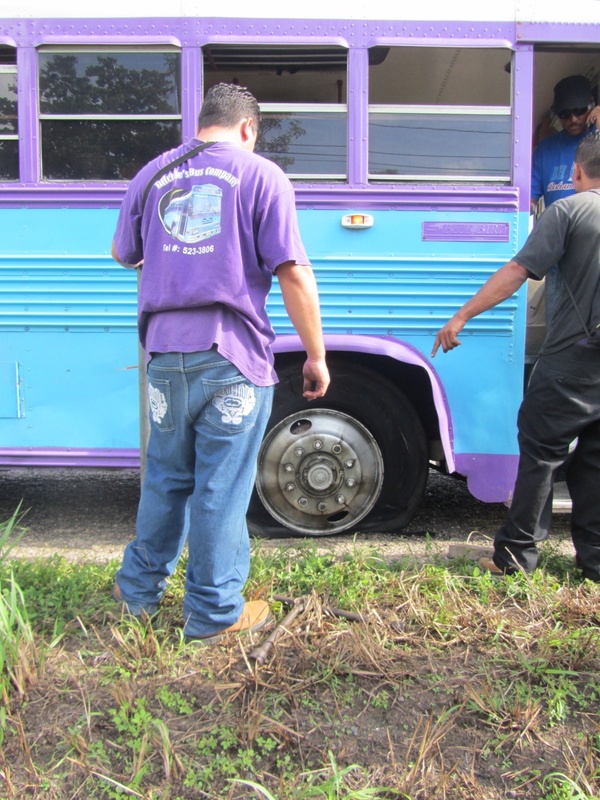 We had this issue on my last bus just outside of Dangriga. But most issues can be avoided with a few tips. First, for a lay of the land, here is a quick overview of the relatively simple highway system. This map (snagged from this website) pretty much says it all. We’ve got the The Northern Highway, the Western Highway, the Southern Highway and my favorite, The Hummingbird Highway. Here are my tips to make things as easy and stress-free as possible. There are schedules online (like on this website) but for the best, most up to date information just ask at the bus station. 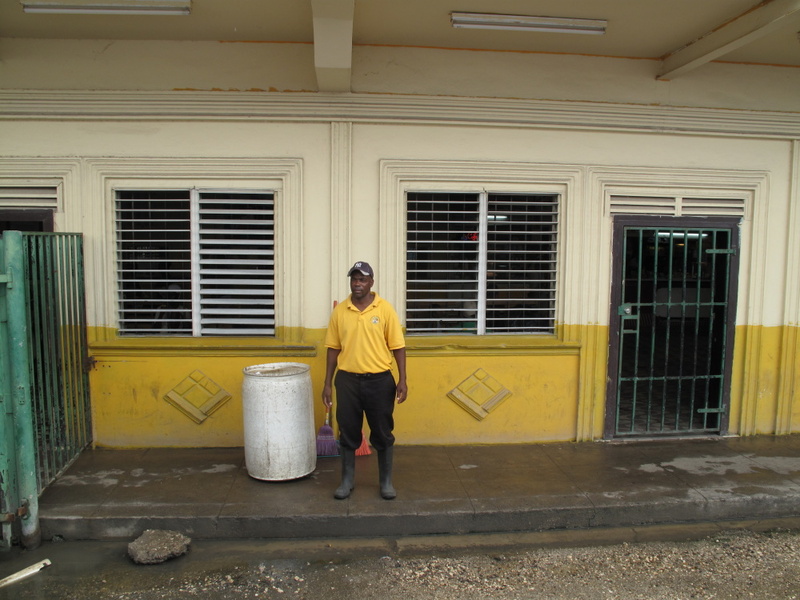 All major stations have the guys in the yellow shirts who work there – like this guy. The back of their shirts say something official. Ask which gate you need to be waiting at, what time you should line up, can he give you the head’s up when the bus arrives. Just ask! They are very helpful. For even faster answers, just ask the person waiting next to you on the bench or in line. In my experience, everyone has been great. 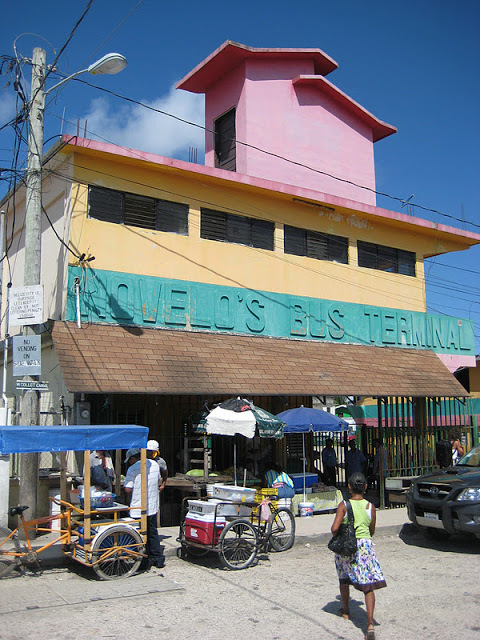 Here are the gates at the Belize City station. 2. Tickets are purchased on the bus. Don’t look for a ticket window at the station. Each bus has the driver and the money collector. You PAY ON THE BUS. Don’t worry about exact change, these guys have plenty. Here is the money collector during the ride. These guys have an amazing ability to keep track of who and when everyone has boarded. I mean it when I say no rules. “I was here first” does not apply. People will enter through different gates and making absolutely no eye contact use their newborn baby to cut in front of you. If you want a seat, you are going to have to work for it. If you don’t get a seat, you will be waiting for the next bus. And that you do not want. Eyes down everyone! If you don’t see the person you are cutting then maybe it didn’t happen. See Tip #1 if you are looking for additional help. Sometimes you can find a super nice employee of the bus station (often the yellow shirted guys cleaning up) who is willing to get on the bus for you and save you a seat. I’ve never asked…they often just suggest it with the unspoken agreement that you will slip them a few bucks. Days to avoid if possible: Friday afternoon and Sunday afternoon/evening. Both are heavy travel days for people going back to work. Obviously there are no bathrooms on these vehicles. 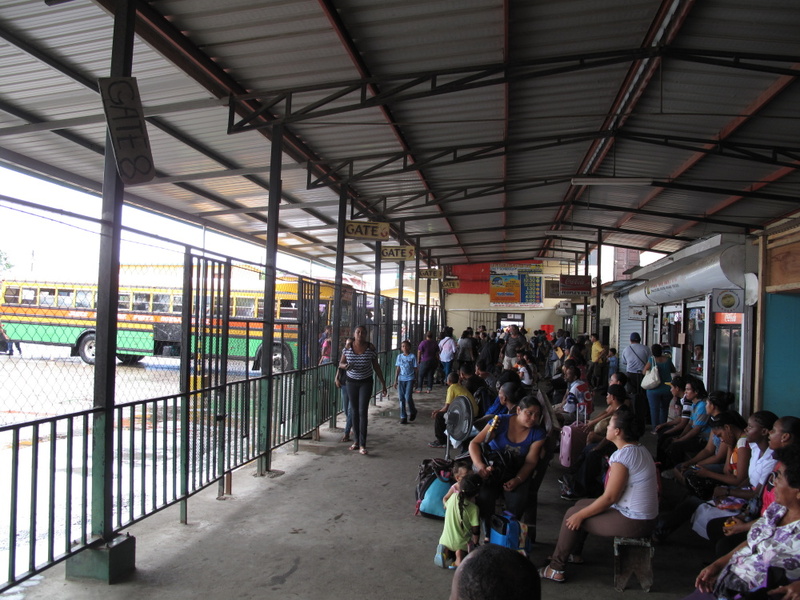 And when you stop for the 5 minute breaks at the larger stations (like Belmopan and Dangriga), the very LAST thing you want to do is lose your seat. If you MUST use the facilities at a stop, ask your seat mate to save yours for you. She will have to say “no someone is sitting there” 1000x while you are gone, so be quick! 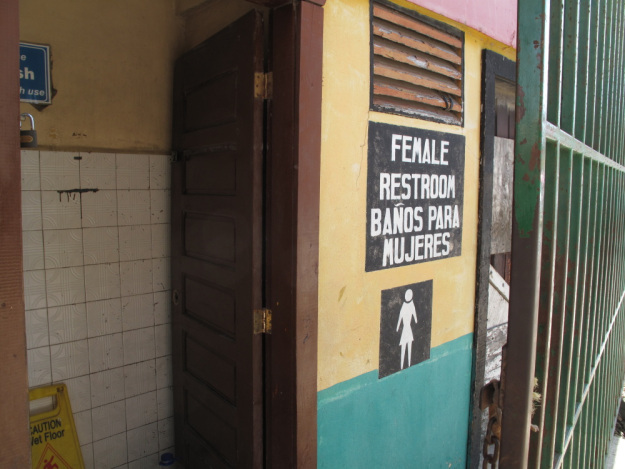 Here is the Belize City terminal and its toilets. It’s 50 cents Belize and not a place where you want to linger. But it does the trick. 5. If you require Air Conditioning or to arrive at your destination with good hair, do not take the bus. These are retired US school buses. Exactly like you remember from your school days. And if you went to school in the 90s or before, it could be the very same bus you took to Benjamin Franklin Junior High. Windows are open, the wind and the dust is whipping. Sunglasses are helpful on dry days. At each major bus station stop and some other smaller ones, people will board the bus or sell you food and drinks through the windows. Don’t worry about a lack of selection. 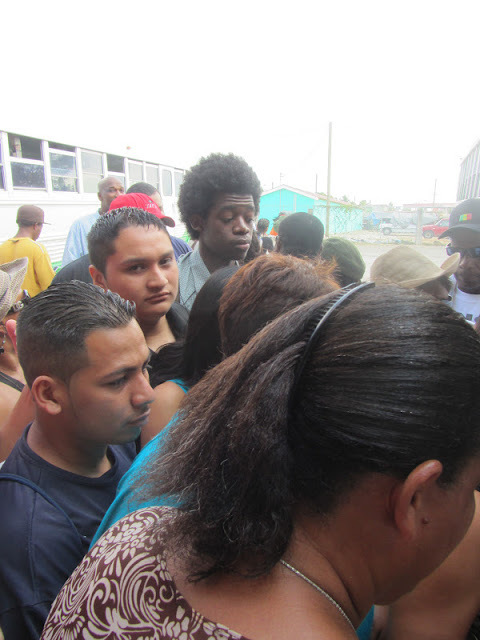 At my last stop at Belmopan (the nation’s capital), I was offered: Dukunu and tamales, packaged cookies and gum (well…he called it chicle), watermelon juice, seaweed shakes, bags of craboo, fresh guavas with or without pepper, pizza and chicken sandwiches, creole buns and banana cake. The last cost me $1bzd. It was a huge hunk and super moist and delicious. It just saves SO much time – the non-express can literally stop every 100 feet. Ask for it by name. 8. The Most Important Rule: BE EASY GOING. The driver might be blasting music you hate (think modern country), the woman who boarded the full bus handed you her baby and proceeded to the standing room in the back, you might have to help an elderly lady load her sack of potatoes, the driver might stop at a Chiney shop to pick up his fried chicken lunch or the “express” bus might stop at every single village in the Maya Mountains…all of these things have happened to me. The bus seats are not all that comfortable. And if you are forced to squeeze three to seat so the bus driver doesn’t get in trouble for having people standing in the aisle? You are going to be extra uncomfortable. Your large bag can be packed in the belly of the bus if you get on at a major station, otherwise bring a bag that can be squished into the overhead storage. A small suitcase works but a duffel bag or backpack is even better. As always in Belize, it’s easiest to travel light. If you are coming from the south, you are probably going to get stopped by BAHA (Belize Agriculture Health Association), where you are asked unload and stand on the side of the road (in summer bring your mosquito repellent), the bus is then boarded by BAHA guys and police and the bus searched for mangoes and drugs (I’m guessing) or maybe drugs stuffed in mangoes. Who knows. My mango got taken. SO in the end, I think Ralph Waldo may have been talking about the bus in Belize when he wrote “Life is a journey, not a destination”. I hope I didn’t scare you off. I really do like travelling by bus. I take it quite often both alone or with a friend. I suggest you try it. The scenery will be interesting…ever thought about stopping at the Hattieville Prison gift shop? and the people watching some of the best in the world. 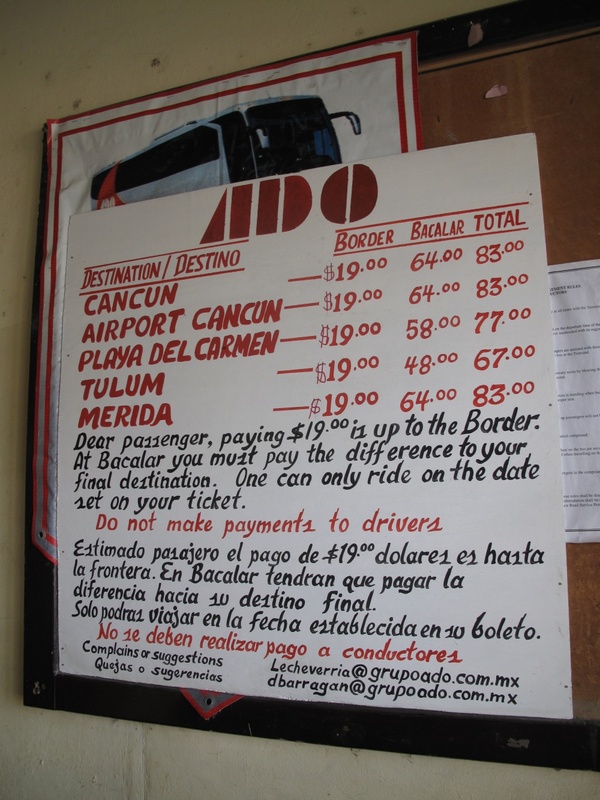 For information on the very different bus from Belize City to Cancun, Mexico, check this post. To save for later, PIN IT. Excellent tips! We were never stopped by BAHA on our trips back from down south, however; perhaps we just got lucky. But you nailed everything else we had to deal with. I had no idea that the concept of a line was so, uh, fluid, in Belize until I took the local buses. Being there first doesn’t matter one bit. The one thing you didn’t cover is having to ride three to a seat at times in order to keep the drivers from getting in trouble. People standing in the aisle is not allowed, though it happens all the time, so when they’re approaching a station, they’d make anyone standing sit down as a third person in the seats, temporarily. NOT easy for three adults in the tiny, child-sized seats! What an experience…and yes, VERY different from the ADO line in Mexico! Ha! YES! I forgot about that. 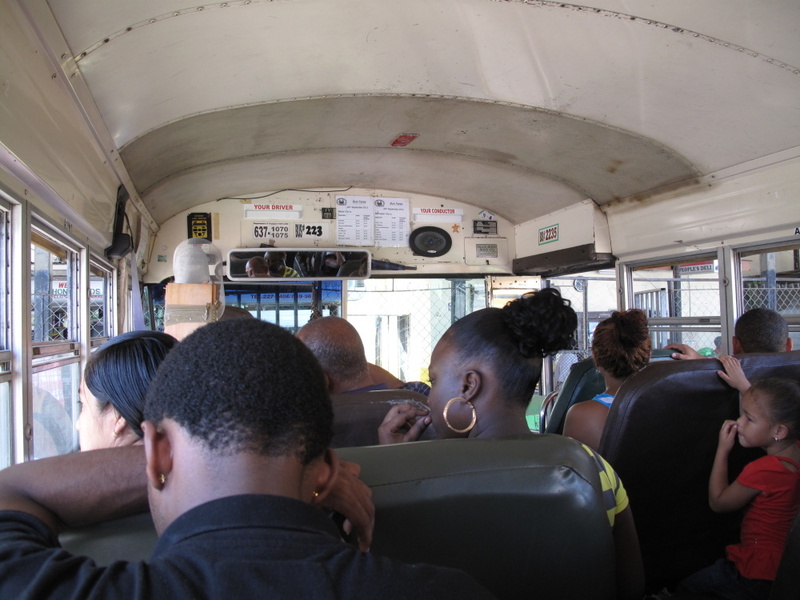 We were full once in San Ignacio and in Belmopan had a school class board the full bus. We all had to take a teenage onto our seats to make three. It was SO HOT and SO SWEATY. Must make another tip! I’m adding a bit on now. Emily, the BAHA stop just started recently, about 2 months ago or so. See explanation above. That explains why you never saw it. I like travelling by bus, too. As for Express buses, I almost never manage to get one. Got to work on that. 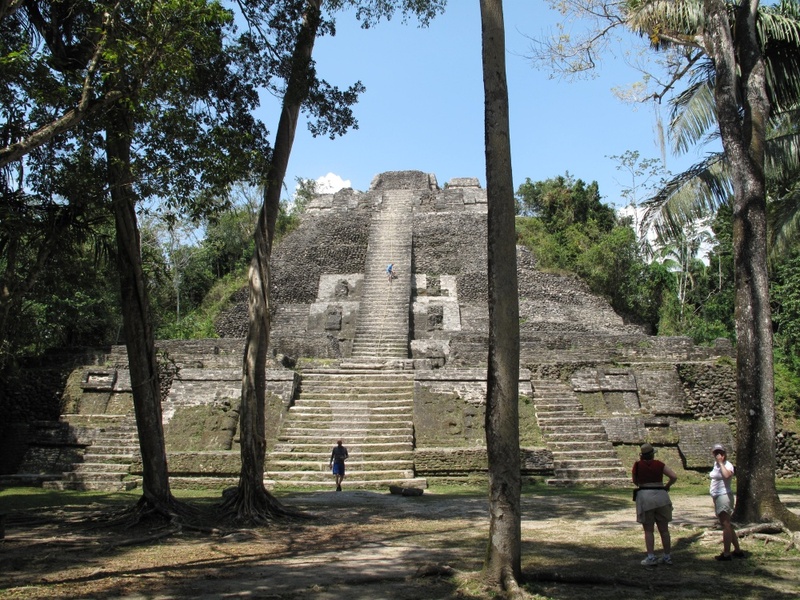 My last trip Belize City to Chetumal took forever! The express thing is definitely tricky. 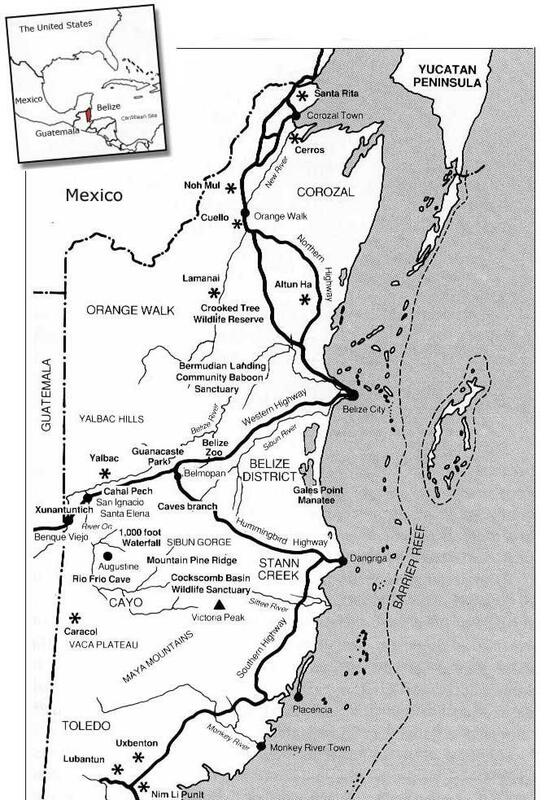 I’m good at getting the Belize City to Belmopan one…but beyond that? I’m hopeless. 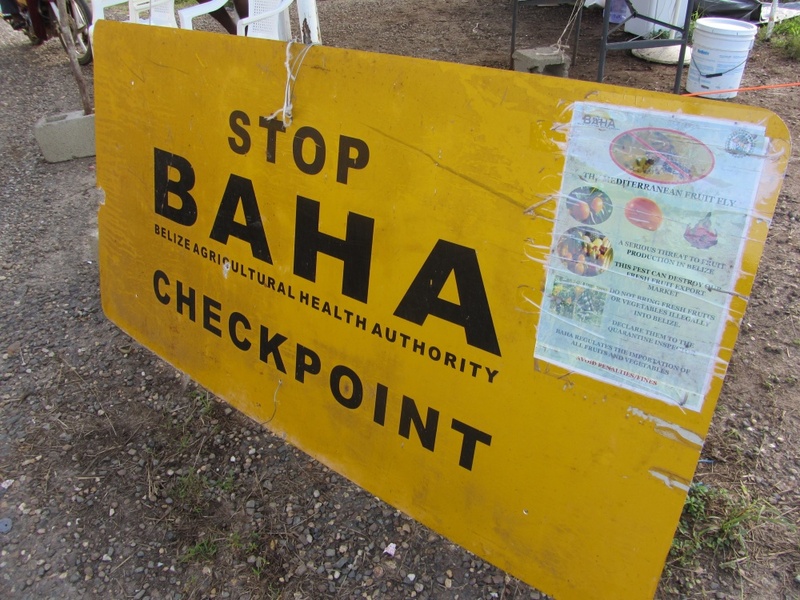 The Baha checkpoints are for the MedFly quarantine. No produce allowed out of southern Belize when it’s in effect. Interesting. I need to figure out what a MedFly is! Mediterranean Fruit Fly, a non-native insect (from guess where). Hopkins is/was infested. They will remove the temporary check point when the traps set in the trees in the south of Belize show no more Medflys. If they migrate to the north, they will destroy the fruit industry. I have a bladder the size of a pea, and for this reason alone, I have never taken a bus in Belize. Your blog has confirmed for me this is a wise decision on my part lol! Great tips! Sharon, on one of our long bus rides down south, I had to use TWO of the bus station banos…they are NOT nice and you have to be speedy to get back onto the bus after, but having the same issue as you, I was able to manage with some degree of effort! If I hadn’t had Barry to save my seat on the bus, though, I never woulda risked it. Haha! Great tips and so accurate.